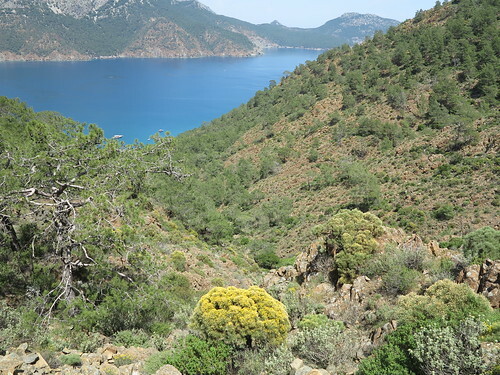 Lycian Way is a 509-km, waymarked hiking trail in southwestern Turkey, connecting Fethiye in the west with southwest of Antalya in the east along the Lycian coast. To walk the trail (best time April/May or October/November) it provides a sense of true Mediterranean Turkey with high diverse nature and ruins of an ancient cities. The national park was established on March 16, 1972 by a decret of the government. It stretches over an area of 34,425 ha beginning in Sarisu, located southwest of Antalya and reaching out to Cape Gelidonya parallel to the Mediterranean Sea across the Kemer-Kumluca shoreline. The ancient settlements Olympos, Phaselis and Idyros are situated within the national park, which lies between the shores of the ancient regions Pamphylia and Lycia.